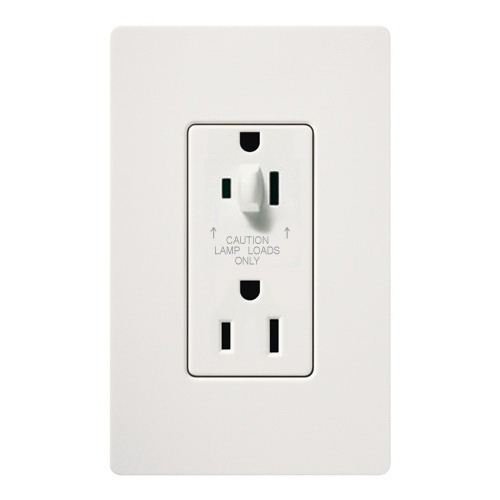 Lutron Satin Colors® Half dimming tamper-resistant duplex receptacle in satin snow color, has a unique design with plastic construction for long-life durability. This specification grade receptacle features permanently installed internal tamper-resistant shutter mechanism that is capable of resisting insertion of foreign elements into the device. It operates at a voltage rating of 125-Volts AC, current rating of 15-Amps, temperature rating of 0 to 40 deg C and frequency rating of 60-Hz. The projecting nubs prevent standards plugs from being used. It uses standard switched receptacle wiring. The duplex receptacle meets UL, CSA, NOM and article 406.11 of the 2008 National Electric Code (NEC) standards.